“These stunning new finishes are in line with Revstar’s overarching raw-power, high-performance aesthetic of vintage street-racing motorbikes,” said Armando Vega, marketing development, YamahaGuitars. Yamaha today unveiled six bold new colors to add to the Revstar line of solid-body electric guitars, expanding their series of instruments designed in the style of '60s-era European café-racer motorcycles. Yamaha designed the Revstar series with painstaking attention to detail, seeking input from professional guitarists and other experts from around the globe. Stunning colors and finishes complement the sleek body contours, while hand-wound pickups and materials perfectly match each instrument's character. Yamaha engineers designed a proprietary Dry Switch to enhance the tone of six guitars in the series, offering the versatility of a coil split and helping to deliver a tone that distinguishes Revstar from the rest of the pack. "These stunning new finishes are in line with Revstar's overarching raw-power, high-performance aesthetic of vintage street-racing motorbikes," said Armando Vega, marketing development, Yamaha Guitars. 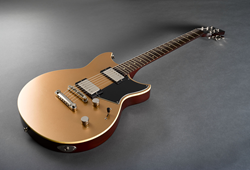 "Revstar guitars are meticulously crafted to sound as good as they look. We spent years perfecting these models, making certain that Revstar guitars include the right balance of engineering, technology and innovation that will inspire players who seek to go beyond the ordinary."